On February 16th, 2012 an exhibition of a selection of my photos together with a selection of Michael Lam’s photos opened at the National Gallery, Castellani House, Georgetown. For me, this represented a significant milestone in the progression of my development as a photographer and an enormous validation of the effort and dedication I have put into photography over the past few years. It goes without saying that this was a massive boost for my ego. Close friends always get a bit irritated at my frequent bouts of self doubt but it is almost impossible for your friends to truly assess the quality of your work. As a result I never really know whether my photos are good, or just good enough for my friends not to have to lie too much to me. 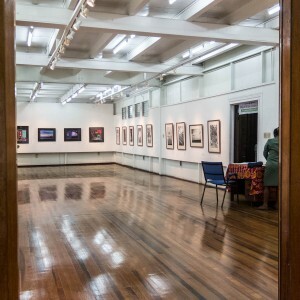 I am not entirely sure that it is safe to assume that the show at the Gallery means that I am not too bad a photographer, but at some point I suppose I have to accept that my photography has passed some level of competence/acceptability. So what of my actual experiences? It was overwhelmingly gratifying to see the diversity of people who visited. I get a strong online response to my photography; but this is usually by a fairly small subset of Guyanese (and a few others) who are either interested in photography, or happen to be internet savvy. So it was a new experience for me to interact personally with people who were seeing my photography for the first time. The positive reaction was very different when received in person. One particularly high note for me was the encouragement local photographers seem to have taken from seeing large framed prints of photographs. Few of them, particularly the younger ones, had realized the impact of a large print hanging on the wall. I recall a young lady, clearly high school age, who visited with her mother. She mentioned how encouraged she was to pursue photography now that she saw Mike’s and my photography. I think that meant more to me than any compliment I might have received on my photos. I think if I have to pick out my most surprising moments, they would have to be the extraordinarily complimentary articles about the show written by Mr. Dave Martins (of the Tradewinds) and Mr. Terrence Roberts, both noted Guyanese artists. It is not merely that their reviews are so unexpectedly favourable, but that these two noted artists would even have reviewed the show. I was told by the curator of the gallery that this was show was one of very few photography shows that had every been hosted by the National Gallery, Castellani House. Mr. Bobby Fernandes, who has been known for many years as the Guyanese photographer, has had a show or two. But this is the first that photographers with very broad and general portfolios have been featured. Ms. Bissember, the Curator, noted that they would now be more receptive to applications from photographers to be featured. Another positive step. A few years ago, when I started to get more involved with photography as a hobby, I never could have imagined that it would be possible for me to show my work at a gallery. While I did occasionally take an interesting photo or two, it never occurred to me that I might eventually put together a body of work of sufficient quality and quantity to facilitate such a show. Malcolm Gladwell said in his book, Outliers, that to become an expert at any activity, you need to practice for 10,000 hours. This is a premise that took the internet by storm not so long ago. 10,000 hours is 417 days, which doesn’t sound that bad until you consider that for a 3 hour a day hobby (in my case) that is just about 10 years. I’ve had my gallery show after 6 years of dedicated practice of at least 3 hours a day. Making a lot of very unscientific and unsupported assumptions based on what I just said, I conclude that I got lucky 🙂 And I guess the harder I work at it, the luckier I will get. Part of the display at Castellani House. Congrats Nikhil sir !! The way you feel when you touch your (HQ) prints is totally different from seeing the same on the Digital screen. !! Best of luck for the future ! I would have to say that even though a few years ago you may not have thought you were going to be featured at a Gallery exhibition, you were still better prepared than I was, I thought you had high hopes and did not think, even when we were told that the Gallery was interested, that I’d be side by side with you showing our work to the public in the National Gallery. The experience was great, different and revealing. Congrats Nikhil, nice to know that your fantastic work is shown at The Castellani House and not only on Flickr. I am working on that watercolor of the Strand Cinema, i will let you see it when i finish it.